Gaetano Blandini was born in Rome on 13 March 1962. He graduated in Political Sciences at the University of Rome. In 1982 he started his career in the Public Administration, holding several offices among which the office of Auditor at the Teatro Regio in Turin and the Fondazione Emilia Romagna Teatro. 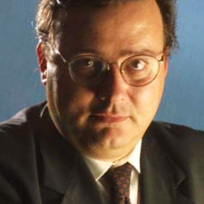 In 2002 he was appointed senior executive of second level of the Italian Ministry for Culture and held the office of Executive Inspector. He was appointed Board Member of Cinecittà Holding SpA. He has collaborated at the drawing up of important texts such as the statute of ETI, the reform of opera-symphonic foundations, the new law for cinema and the decrees for the FUS (Show Business Only Fund). In 2004 he was appointed General Manager for Cinema at the Italian Ministry for Culture and has been confirmed several times. Since 15 December 2009 he has been the Managing Director of SIAE.